The rumbling to life of a half-dozen V-Twins brings a collective smile. We’ll pull out in formation, heading 300 miles East to the first night’s destination in famous Baker City. You’ll understand why when you begin the adventure and travel the colorful history of the Oregon Trail and through the majestic Wallowa Mountains of Northeast Oregon. As always, it’ll be good to be on the road. 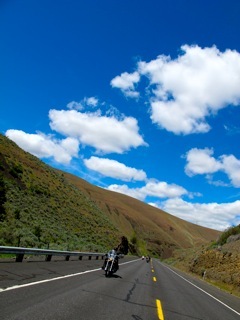 We call it the Hells Canyon Motorcycle Rally (HCMR). A two-wheeled tour with friends from various walks of American life with the single mission of enjoying the ride to a gold mine of geology, scenery, plants and wildlife. Home of several scenic byways including the Elkhorn Drive National Scenic Byway that’s a dream to put your bike on one of the greatest motorcycle roads anywhere. Our journey will begin in just a few days. It’s a long enough ride for everyone to find their groove, yet sprinkled in with a few stops where conversations recount who we are, where we’ve been and what we’ve seen. That’s how road trips work. It also gives this ever-fashionable blog editor a chance to swap the wingtips for a more suitable form of footgear. 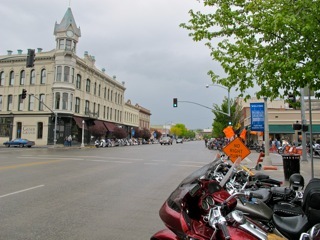 Along the way we’ll find motorcycle friendly businesses that speak “two-wheel” and once we end at the “Queen City of the Mines” (Baker City) the Folkestad motorcycle rally ambience will take hold. I’ve blogged about previous trips HERE for 2011, HERE for 2010 and in 2009 HERE. There was fun, sun, cerveza’s and of course a dash of rain. Mixed in along the way was some imperfect weather, but what can a person expect living in the northwest in June?! It’s an imperfect world and besides, many riders revel in the glory of making it through adversity. Not me… I like perfect weather versus keeping track of the number times I had to dawn on rain gear. But that’s me. The posse started this ride on Interstate 84 to pick up a buddy in “Googleville” (aka The Dalles) then at Biggs Junction we rode south on Hwy 97 to Wasco. From there we traversed Hwy 206(Wasco-Heppner Hwy) to Condon. This stretch of road offers up a lot of sweepers and depending on which type of bike you ride it could be fast or a mental exercise to stay alert. You’ll never get lonely on this stretch of road, not because of the number of RVs or automobiles – there are none – but because squirrels frequently run out across the road to challenge your dodging skills and if you’re real lucky you’ll get the occasional mule deer to snap you back to reality. 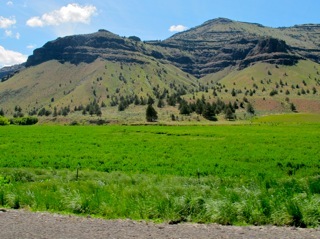 From Condon we rode Hwy 19 to Fossil where we took a detour on Hwy 218 to the Clarno Unit of the John Day Fossil Beds. The Clarno Unit is located 18 miles west of Fossil and is just under a couple thousand acres in size. It’s a remote area and Hwy 218 is a real joy to ride. There is nothing which explains the exhilaration of roaring out of tight corners and setting up for the next hairpin. There is an odd trend in this area of marking an entire set of 6+ curves with one single sign marked with the speed of the slowest and tightest of the entire bunch of curves. The first 5 corners are truly 45MPH then the last one is a 20MPH right angle with gravel on the apex. Good to see the state saving money on road signs! 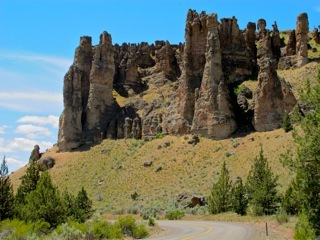 The views of Central Oregon’s near-desert environment are astounding and this highway was nearly empty of anything other than a variety of grasses, sagebrush and juniper. The cliffs of the Palisades are the most prominent landform in the Clarno Unit and the trip wouldn’t have be complete without a photo op. We back tracked the 18 miles to the junction of Washington Street and Seventh Street (Hwy 19)… street names in Fossil make it seem like a big town – it’s not. We then proceeded south to Service Creek then to Mitchell and picked up Hwy 26 east (essentially follows the Oregon Trail) to John Day, Prairie City and then we veered off at Bates onto Hwy 7 (Whitney Tipton Hwy) toward Sumpter. Along this area we unfortunately came upon a motorcycle accident between Sumpter and Baker City just after Philips Lake. The rider failed to negotiate a sweeper and laid the bike down. The footboard and engine guard made deep grooves into the asphalt as the motorcycle and rider slid off the right shoulder of the road down an embankment onto some soft brush. The rider narrowly missed hitting a guard rail and survived with only minor injuries. Very fortunate. The motorcycle was towed away. Traveling this route was basically going from one mountain pass to another separated by valleys, small towns and river valleys. The passes were over 5000’ and the changes in temperature were notable until we arrived in Baker City. After 400+ miles we arrived at the Best Western Motel and were greeted with smiling employees who got us checked in and on our way to dinner at Arceo’s Family Mexican Restaurant. It was awesome! 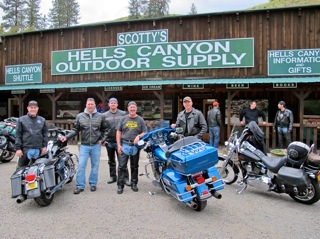 Postcard From Hells Canyon Motorcycle Rally – Part 2 HERE. After what seemed like an endless night of chatting voices and the occasional AC/DC rocking through the school ground all was quiet and I settled into the two-man tent and mummy style sleeping bag. With the rain showers and 45 degree temperatures everything was slimed with dew even with a rain fly. I know my way around the outdoors, but I’m in no way a boy scout or survivalist camper. Motorcycle camping is much more comparable to bicycle camping than car camping due to the limited storage capacity. Often the same equipment as backpackers is used because of lighter weights and compact dimensions associated with the backpacking equipment. I had one saddle bag allocated to tent, rain fly, mat, sleeping bag, torso air-mat, mini-chair and compression pillow. The magic is called stuff sacks! My plan was to be just comfortable enough and since I had previously purchased most of the items for other activities it wouldn’t be expensive to pull together this camping gig. I wasn’t traversing Mt. Everest, or hiking the 3 Sisters Trail and food/stove/cookware were left at home because in my simple world… coffee and food was picked up along the way. Because in the Northwest it tends to rain, a good tent is important. A sleeping bag that is comfortable below freezing is important too. However, the mummy bag was like a restraint. I kept thinking would a sleeping bag that weighs 2 pounds vs. 3 really have mattered? No! Space was the key and I could have fit a square bag. The old school Therm-a-rest air pad provided some comfort, but not nearly as cushy as the oversized Outdoor Research thick air mats. The good news is that in today’s compression sack world everything is about twice as small as a few years ago. Note to Steve and the HCMR planners… make sure next year there is coffee in the high school gym. They could have paid for 3 teachers salary had they set up a coffee stand even with 3-day old donuts from Safeway! Nothing worse than a karaoke hangover and no coffee for miles! Okay enough on the camping adventure. We broke camp, re-packed the bikes (interestingly after everything gets wet it doesn’t compress as well – go figure!) and headed toward the McCafe’ and official event booths at the Best Western. 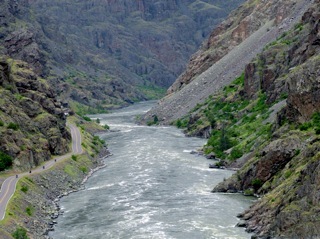 Our plan was a casual ride on the Hells Canyon Scenic Byway and overnight in LaGrande. 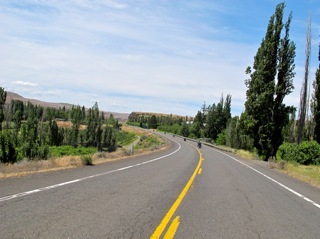 The ride follows Hwy 86 a national designated scenic byway. 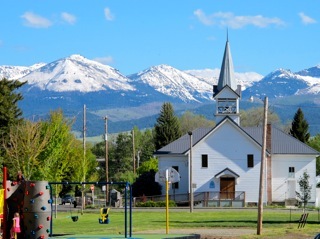 The route circles the Wallowa Mountains by way of Halfway and Joseph then north through the small towns of Enterprise, Lostine, and Wallowa. 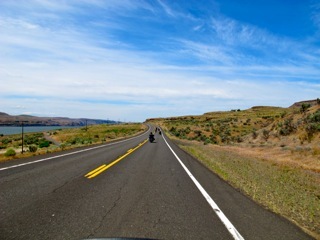 There were thousands of curves and plenty of motorcycle traffic. Between Hole-in-the-Wall-Slide and Richland there were two motorcycle accidents within a quarter mile of each other. Neither of them related, but both made everyone take a moment of pause. The first was a lady that failed to negotiate a curve and rode off the road and down into the ditch. Not life threatening, but she was taken away by ambulance. The second and much more serious was Rick Meigs getting clipped by a vehicle that “crossed the center line.” It was a hit and run. He was taken by ambulance to Baker City where they performed emergency surgery to stabilize him then he was flown by Life Flight to Saint Alphonsus Regional Medical Center in Boise Idaho, where he is now, in critical condition. I don’t know Rick and researched this accident on the web after coming up on the scene. Nonetheless, send your prayers and/or follow updates on his progress HERE. Beyond Halfway, the road becomes a paved Forest Service stretch as it climbs over a pass toward Joseph. This road has a lot of switchbacks and ‘over-the-cliff’ moments so you’ll want to be most alert through the area. 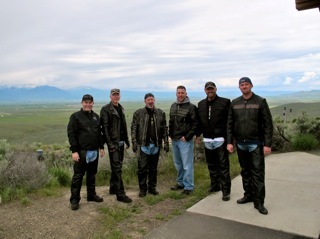 We took a break at the Hells Canyon Overlook, but was unable to pick out the Seven Devils on the horizon due to the approaching rain storm. Within 15 minutes there was solid rain so, we moved on and continue toward Joseph in full rain gear. It was wet and slow going in the canyons. The big corner preceding Joseph is one of those turns you typically never forget as The Wallowas come into view behind Joseph like a movie scene out of the Swiss Alps. We stopped for lunch and to dry out a bit. 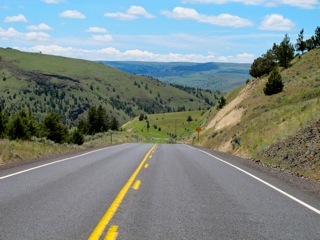 After Joseph there is a great stretch of motorcycle road through the Wallowa Valley and the mountain towns of Enterprise, Lostine, and Wallowa. 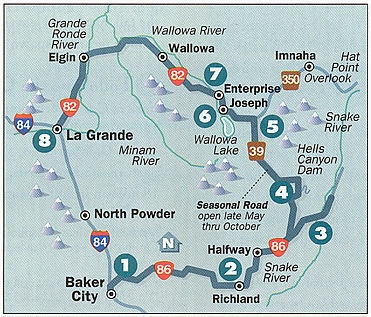 We finish the loop on I-84 in La Grande, Or., as the Historic Baker City bars were no longer calling our name. Neither were the tents! We checked into a motel and proceeded directly to the hot tub to warm up. 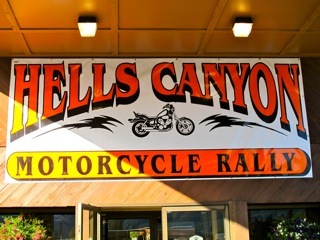 Hells Canyon Rally Wrap Up – Day 1 HERE and Day 3 HERE. 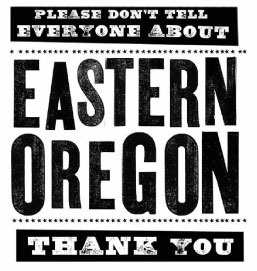 For the folks who live in Oregon it seems like 3 seasons of: almost winter, winter, still winter as we wait on the final and 4th season – road construction! 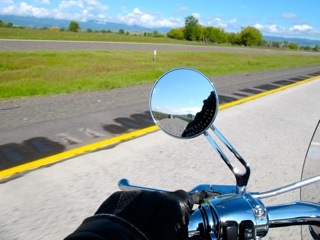 Now that ‘road construction’ is upon us and warmer weather is getting repeatable it’s time for the Hells Canyon Motorcycle Rally. 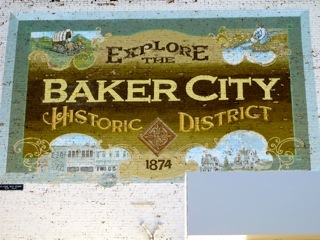 It all happens June 12-15 in historic Baker City, OR and this year marks the 10th anniversary of the rally. The rally is open to all bikes and bikers. On Friday (12th) the Plymouth Tavern, in Plymouth Washington is the Official Lunch stop for the rally. Being at the east end of SR-14 it is a good location for riders vectoring in from all points northwest. Jason, the owner, will be serving up specials for HCMR riders and you can check out HERE for more info. Riders coming from the East may want to consider High Desert H-D in Meridian, ID. as a meet up location. A couple of key points to pass along from the organizers after you get settled in Baker City, be sure and stop by the HCMR booth at the Sunridge Ride Center. They have new Official clothing, registration and info that you can’t get anywhere else. Additional vendors are located at Ride Center and Downtown, they will be open Friday, Saturday pretty much all day and Sunday till noon. There are a number of watering holes: These would include Sonny’s Bar & Grill at the Sunridge, Golden Crown on Campbell St, Stockman’s Bar, Brew-In-Stein, Barley Brown’s Brew Pub, Main Event, Geiser Saloon all on Main Street or the Idle Hour on Broadway. Friday night most riders will want to take the Shuttle (you’ll need your wristband from the registration packet for this) to the Baker High School where hundreds of bikers will be camped. Eric, co-founder of the rally, will be showing classic motorcycle movies in the campground after dark. Don’t forget that Saturday is about the RIDES. 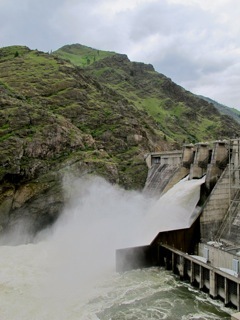 With the Hells Canyon Scenic Byway, The Devil’s Tail, The Ghost Town – Gold Rush Loop or Strawberry Mountain on the riding agenda there is no time to waste. If you’re not going to this rally you’ll miss some great rides and fun time! Photo courtesy Google and Pine Valley Lodge.